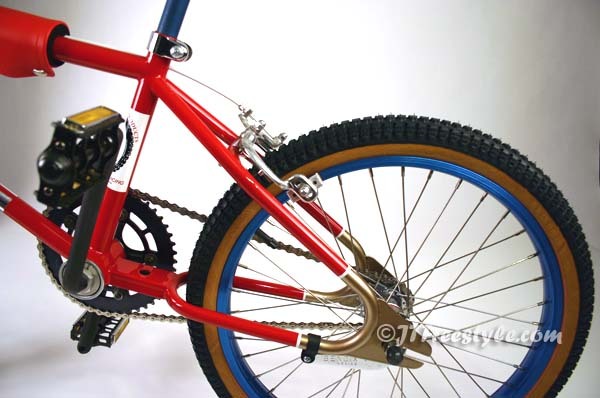 Dennis Dain was sponsored by Ralph's Bicycles and co-sponsored by Cook Bros. A custom Red and Gold frame was designed for Dennis. Minicycle BMX/Action magazine was featuring the Cook Bros. racers and their bikes in the October issue. Unbeknown to Dennis Cook Bros. had him wear the Cook Bros. jersey instead of the Ralph's jersey, that didn't set too well with Ralph. The article features Dennis's 26lbs bike as he preferred a stronger bike than super light bikes as he was a bigger and stronger rider. 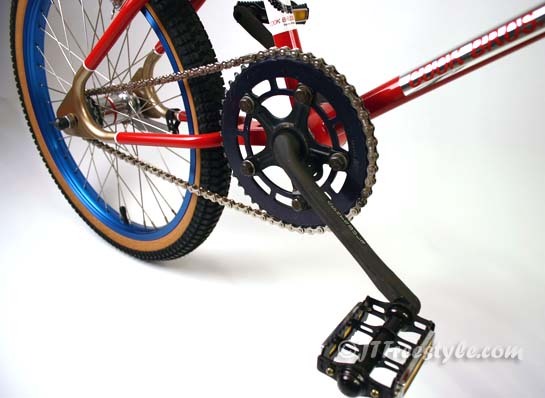 I told Dennis about the build in 2008 and still had a hard time finding the seat, spider, and chainring. As with my 1979 Dennis Dain Redline replica he sent me a seat, spider, and chainring from the original bike! To top it off the original 173 plate and photos from the Minicycle photo shoot, talk about awesome!! Had a nearly perfect nickel frame that I had stripped then had it professionally painted exactly like his original, even hand painted pin stripes. Slapped it all together right before the 2010 Rockford Vintage gathering. Created a poster of Dennis's photo's and magazine shots to go along with the bike. It was well received at the Rockford! 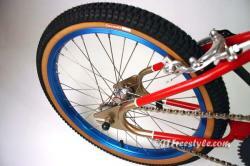 I promised Robert Cook, Gary Cook's son, that I would show him this and my other Cook Bros. bikes. 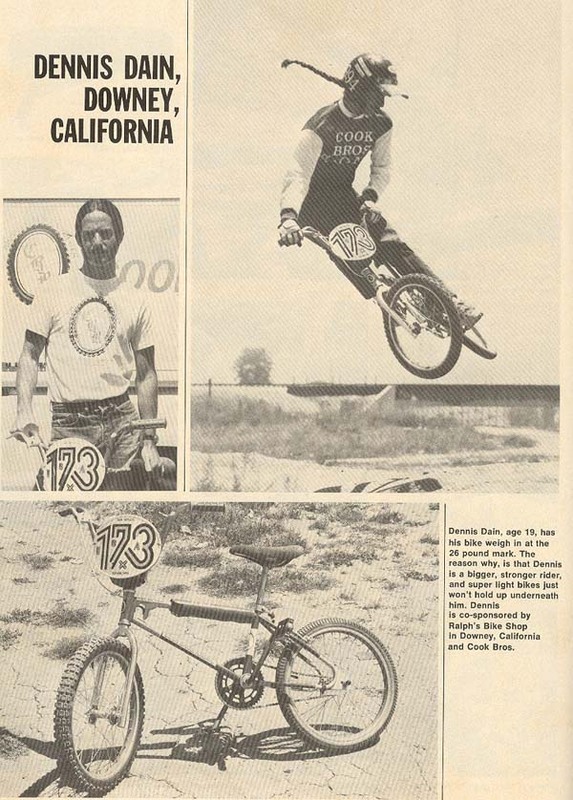 Well I packed up four CBR's and sent them to sunny California for the 40th Anniversary of BMX celebration. It was great to have Dennis see it first hand and Robert was blown away by it too! The Cook Bros. (Gary and Craig) created awesome products and as Dennis has stated, he won more races riding a Cook Bros. than any other bike. 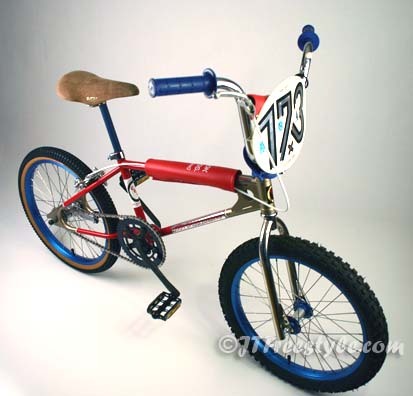 A special thanks to Dennis for allowing me to share his personal BMX items on this bike to make it that much more special!